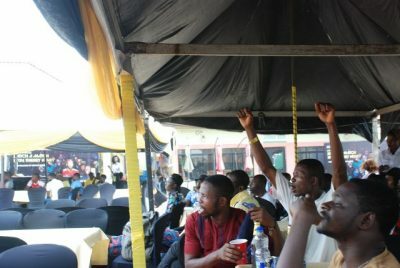 English Premier League lovers in Ibadan were treated to an exciting “Fanzone” experience on Saturday 18th November, for the screening of the highly anticipated Arsenal V Tottenham HotSpur match. 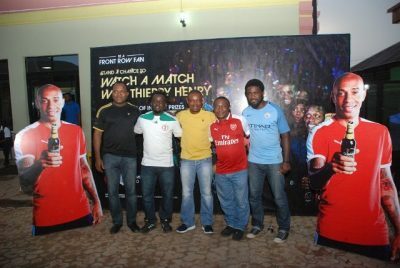 Football fans experienced an incredible evening complete with live commentary from Hakeem Lawal, Oluwafemi Aliu and Demola Adedeji of Naija FM. 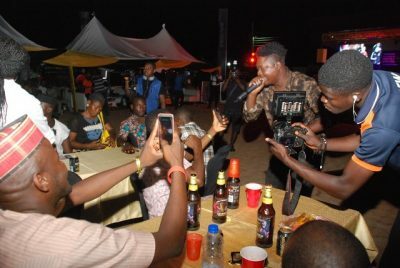 The evening was rounded off by a live music performance from Award winning artiste Reminisce and Ibadan bred artiste Oyinkanade who consistently show that they are Made Of Black by showcasing sheer determination, passion and hard work in their music; values that exemplify the Guinness Made of Black movement. 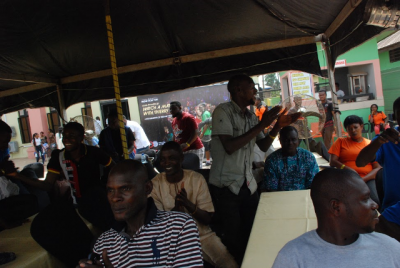 The Guinness Fanzone activities are designed to celebrate Nigeria’s passion for football and music and to unite communities through incredible football experiences – in a way that only Guinness can do. 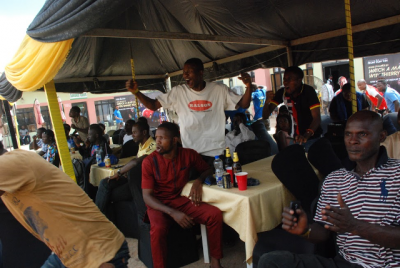 The Ibadan Fanzone experience is coming the wake of the recent launch of Guinness Foreign Extra Stout “Be A Front Row Fan” National Consumer Promotion. 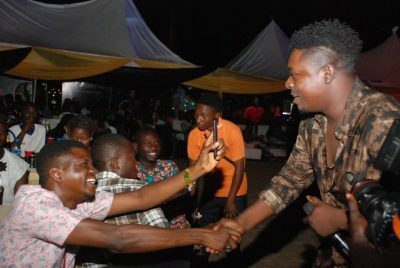 The promotion which has recorded Three One Million Naira (N1,000,000) Winners already will reward Fourteen lucky winners with One Million Naira (N1,000,000), thousands with Five Thousand Naira (N5,000) and Million consumers with airtime. 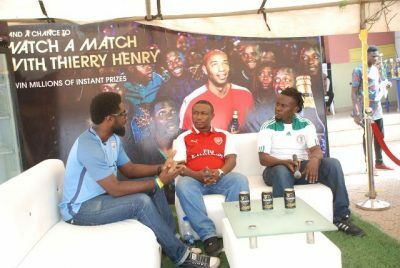 The Ibadan event which took place at Watershed bar provided EPL fans the opportunity to showcase their passion for football. 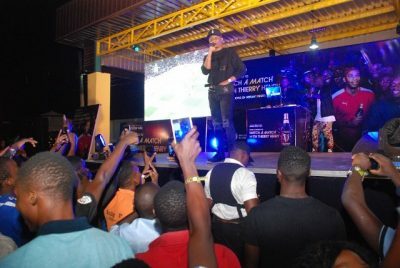 Fans were rewarded with a free Guinness Foreign Extra Stout for every Guinness Foreign Extra Stout bought at the venue and also had the chance to win airtime units. Our consumers are at the heart of what we do and we always strive to delight them”, said ‘Nike Adebola, Marketing Director, Guinness Nigeria. 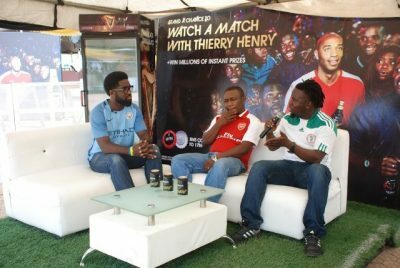 Knowing how passionate Nigerians are about music and football and how they fully give themselves to these passions without inhibitions, we launched “Guinness Fanzones to create totally different and amazing football experience. On the National Consumer Promotion, Adenike Adebola said that “we are very happy that the first two weeks of the draws have been concluded and the first Two Millionaires (2) have been rewarded. At the launch of the promo, we announced that every week, one lucky winner will win One Million Naira (N1,000,000). Furthermore, consumers will stand a chance to win Five Thousand Naira (N5,000) each, plus airtime worth millions of naira daily. 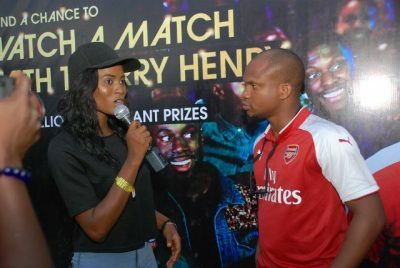 “Also, Fourteen (14) lucky consumers of Guinness Foreign Extra Stout will stand a chance to watch a game with international football icon, Thierry Henry when he visits in Nigerian on December 17th and 18th’. “As a brand,” he continued, “we celebrate those who are Made of Black- those who continually carve their own path without inhibitions. The “Be A Front Row Fan” promotion will run from October 23 2017 to January 31 2018, winners will be selected weekly from all over Nigeria. To participate in the promo, consumers only need to buy a bottle of Guinness Foreign Extra Stout, open the crown cork to reveal a code; SMS the code to 1759 e.g: SMS T8R7KYU7 to 1759. 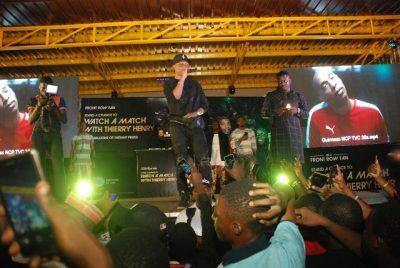 Guinness has sustained a historic association to Football in Nigeria through its sponsorship of the EPL broadcast in Nigeria on Super Sports as well as its sponsorship of the Nigerian National Team- Super Eagles and annual consumer promotions such as Every Minute Made of Black that reward fans who buy and enjoy Guinness while watching the game.